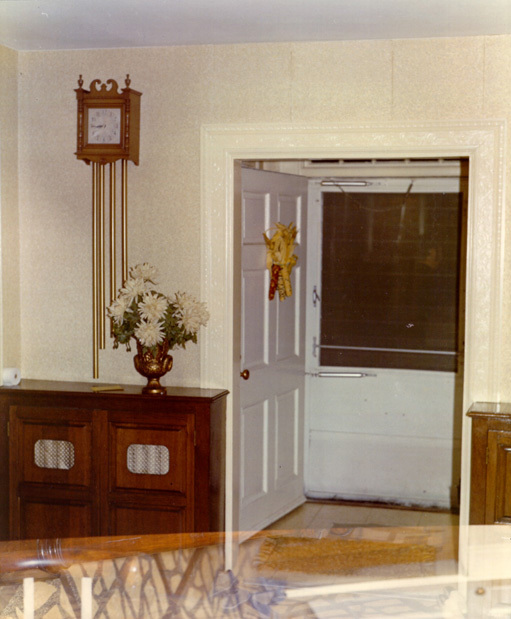 Left, the front door of the DeFeo house which opened into the marble-floored foyer. In the darkened foyer, there was not a sound except for that of the clock ticking on the wall behind these men or the sound of their shoes on the cold, slick marble floor. A hairbrush, strangely out of place, lay on the marble floor in the threshold between the foyer and the dining room to their immediate right. A blue hairbrush lies on the foyer marble at the threshold to the dining room. The DeFeo dining room. A vase of plastic roses sits in the middle of the table. In the background, the "red line" telephone extension which Joey Yeswoit would use to summon the Amityville Village Police Department. The DeFeo children's school books lay on the table. The dining room was darker than dark. What little light entered the house had little effect in the dining room, where the rich burgundy textured wallpaper gobbled up light. A chandelier hung from the ceiling; the younger DeFeo children's textbooks lay on the dining room table as if awaiting their next day of use of at St. Martin of Tours Catholic school just mere minutes from the DeFeo house. A set of French doors led to the veranda and in-ground swimming pool in the backyard. The DeFeo living room. The large piano dominated the room. Glancing to the left, the men had a view of the DeFeo's eloquently furnished living room, complete with an ornate roccocco swirled grand piano which dominated the room. Atop the piano were several Halloween cards from the holiday that had passed less than two weeks before. The fireplace stood cold, dark. Beyond the room was the sun porch, which had been a center point of DeFeo parties and celebrations, the likes of which Bobby Kelske had participated in. The built-in bar within the sun porch was dead silent, illuminated with the dim light bleeding through the three curtained eight-light sun porch windows that looked out to Ocean Avenue and Ireland Place. The sunporch in the DeFeo home which was just off the elegant living room. The DeFeo's very well stocked bar is to the left in the photo. Looking up, the DeFeo's oil portraits maintained silent vigil. Passing the portraits while being led by Bobby Kelske, Scordamaglia, Saxon, Altieri and Joe Yeswoit quietly plodded up the steps covered by blood-red carpet. At the top, in the landing, thick yellow curtains framed an ornate set of windows that permitted but enough dim light to make passage possible. Right, The staircase in the DeFeo home. It was up these stairs that Bobby Kelske and the other patrons from Henry's Bar travelled enroute to a horrific discovery on the night of November 13, 1974. Below, the landing at the top of the second floor staircase. 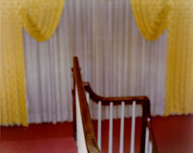 Rounding the landing and carefully taking the last two steps from the landing to the second floor hallway, and while passing the regal portrait of Louise DeFeo and her father, Mike Brigante, the men went to the second door on the right----the master bedroom of Ronald and Louise DeFeo. Because Bobby Kelske had been a frequent visitor to the home, he knew right where Ronald and Louise's bedroom was located. The door to the room, post Butch DeFeo's discovery, remained open. The scent of death had grown more stringent as the men had ascended the stairs and rounded the landing. By now, the victims had been dead for approximately 15-16 hours. Reaching inside the door, Bobby Kelske flicked the light switch to his left. 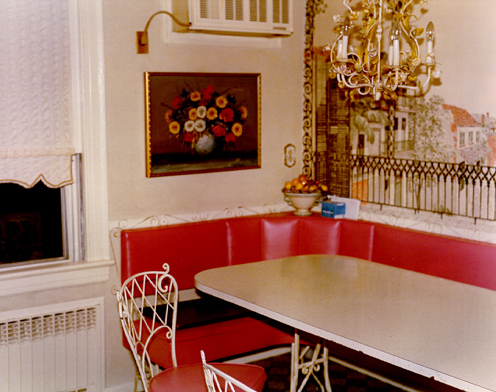 The filaments in the overhead incandescent bulbs of the ornate light fixture over Ronald and Louise DeFeo's bed heated to life and instantaneously painted a grim picture. Gilded clocks and knicknacks adored the nighstands positioned on either side of the bed upon which the eldest DeFeos lay. However, they were not sleeping. They were indeed, dead. Ronald DeFeo Sr., just days shy of his 44th birthday, lay closest to the men on the right side of the bed, which, in reality, was two mattresses shoved together. His right foot dangled over the bed, and he was clad in nothing but light blue boxer shorts. In the middle of his back, plain as day, was a quarter-sized bullet hole. A river of rich red once-oxygenated blood had run from the wound and down the center of DeFeo's back, and provided the first obvious clue as to a timeframe: the blood was dried, so obviously, DeFeo had been laying in this position for a while. A second wound was visible just above the left kidney, which produced another dried river of blood that seemed to run under DeFeo and into the mattress. The bodies of Ronald and Louise DeFeo as they were discovered on the night of November 13, 1974. While Ronald DeFeo's body painted a stark, shocking portrait of death with but a mere glimpse, it was Louise DeFeo that might have given the boys a glimmer of hope. Maybe she was still alive? Maybe she was just sleeping? As their eyes drifted from the stark, nearly naked Ronald to his wife to his left, it appeared that she might just be in a deep sleep. In fact, she was tucked-in in such a neat and tidy manner beneath the warm yellow-gold blanket, and absent any blood or gore that one might have wondered, "how did she sleep through her husband's massacre?" However, Mrs. DeFeo did not move an inch. Not a breath. There was no response, and it was apparent, even as she lacked any signs of violence, that she, too, was beyond any help that these men could provide. Left, The body of Louise DeFeo neatly tucked under the covers. The scene was made entirely more gruesome, if not intense by beveled mirrors at the back of the room. 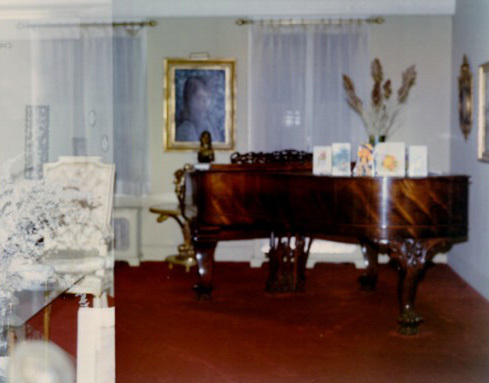 While the rest of the room was that of a beige/brown/gold wallpaper, the DeFeo's had converted the entire west wall of the bedroom to mirrors, covering the only window that looked out over the sun porch and Ocean Avenue. Against this wall was placed their bed. There, in the glass of those mirrors, the scene was doubly horrific, and each of the men---Kelske, Yeswoit, Saxon, Altieri and Skully---could see their own reflections; their own shocked faces. With this, Bobby Kelske, it is reported, began to become violently ill; a combination of the imagery coupled with the smell that was becoming overwhelming. The men quickly grabbed Kelske and led him down the stairs to fresh air, with the exception of John Altieri. Altieri remained upstairs for a few minutes more, investigating the scene. As the men reached the foot of the stairs in the foyer, Joe Yeswoit split from the group and ventured into the dark dining room. Flipping on the light, he searched for a phone. Sure enough, the dining room had it's own extension. Yeswoit rounded the end of the table, making his way for the red phone near the corner hutch at the east side of the room next to a large candelabra. He couldn't, again, help but notice the children's schoolbooks on the table or the large centerpiece of what looked like nearly two-dozen roses, now drooping. Everywhere one looked in the DeFeo house it was easy to see that, amongst sudden death, busy and productive lives had existed, and it was apparent that they had been interrupted quite suddenly and unexpectedly. Reaching the phone, Yeswoit picked up the red line, and called 911. It had been rumored that Louise DeFeo was having an affair with the artist who had been commissioned several years earlier to paint the DeFeo's portraits. It was also alleged that Louise had had an affair with a lawyer from the United Jewish Appeal. Apparently, she had come to know the attorney as he was a friend of her husbands' who had been invited over to the house. While some sources speculate that Big Ronnie never learned of his wife's adulterous relationships, it was said that the red phone in the dining room had been installed as a means for Ronald to keep tabs on his wife. Supposedly, only Ronald had the number to the "red line" and he would call the line at various times throughout the day to check up on his wife. The stories of Louise DeFeo's adulterous liaisons cannot be confirmed; not a shred of information be found to substantiate these long standing allegations. Most interestingly, however, it is now known and substantiated on paper that the DeFeos had a minimum of two landline telephone numbers into their residence and possibly a third. The 911 operator dispatched, rather appropriately, the Amityville Police Department. It had taken the dispatcher a few moments to wrangle the confusing details from Yeswoit, but once she understood that there had been a multiple shooting, help was on the way. The village had an obvious jurisdiction over crimes committed within its boundaries. Officer Kenneth Greguski was the first to be dispatched to the scene. Greguski, a young beat cop who would eventually work his way to the post of Chief, was working a late beat, had just picked up a sandwich at a local deli. He responded and was the very first law enforcement officer to arrive at 112 Ocean. While certain accounts state that Greguski roared down Ocean Avenue with his lights and sirens blazing, it must be remembered that this was a quiet, upscale community and Greguski would have likely not made such a grand spectacle of his arrival. After all, there were many details unclear at this point. Could it be a false alarm? Had there really been a shooting? By all accounts, Greguski was cool as ice, calm and collected as a police officer is expected to be when he pulled up to the large, dark grey Dutch Colonial. His lunch break would have to wait. Passing the ominous High Hopes sign that swayed in a soft, chilly breeze, Greguski found Butch DeFeo and Bobby Kelske on the front lawn. Greguski made his initial inquiry as to "what's happened?" Excited, crying and upset, Butch DeFeo informed the beat cop that his parents were dead. By now, John Altieri had joined the group, too. He had some new information to share about his exploration of the upstairs. The news was not good. The uncovered body of John Matthew DeFeo,9 as it was discovered by John Altieri on the evening of November 13, 1974. In the bed on the opposite side of the room lay his 11-year old brother, Marc. Both boys had been shot at extremely close range with a .35 Marlin rifle. 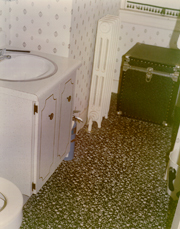 Altieri had stayed behind when Kelske was escorted downstairs as he began to become ill. Altieri had rounded the banister of the second floor and entered a bedroom at the northeast corner of the house just before the third-floor stairs leading to the attic bedrooms of Butch and his eldest sister Dawn DeFeo, 18. Why Altieri skipped the first door is unknown, but the second door on the east side of the hallway yielded a devastating sight: two young boys, Marc Gregory and John Matthew DeFeo, 11 and 9 respectively, laid face down in their beds. Both boys were in pajama bottoms; Marc DeFeo wearing a white short sleeve shirt, while his brother wore a long-sleeve Knicks shirt. It was evident that both boys were dead; shot at close range right in the middle of their backs. The shooter had done nothing to mask the carnage. Neither boy had been covered; blood soaked their nightshirts, urine soaked their pajamas begging whether the release had been a natural reaction in death----or had the boys been terrorized and scared to death before the blasts came? Next to Marc's bed sat his wheelchair, and such presence, for several of the investigators that night, made the crime all the more horrific. Here was a young man, 11 years of age, who reportedly couldn't even turn over in bed due to his football injury. He had been slaughtered senselessly and without the fighting chance of at least being able to run, to hide, or to fight back. By now, Altieri, sharing this information with the group just outside the house left Greguski with the assessment that there was, possibly, four dead bodies in the house for which he hadn't verified with his own eyes. Leaving Butch and the others outside, he entered 112 Ocean Avenue and headed up the stairs to the second floor. Once there, he too verified that Marc, John, Louise and Ronald DeFeo were lying face down in their beds, all victims of gunshot wounds, apparently administered at fairly close range. When Greguski returned downstairs, he found an almost inconsolable Butch DeFeo, accompanied by Bobby Kelske in the kitchen nook of the DeFeo house. At some point, which is entirely unclear based on various accounts, Bobby Kelske had picked up the phone and called Rocco DeFeo, Butch's paternal grandfather and advised him at his West Islip home that "there's been a terrible accident...you had better come right away." 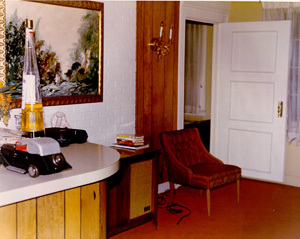 The DeFeo's small kitchen was positioned on the northeast side of the house behind the DeFeo's dining room. Greguski wasted no time using either the kitchen phone or the "red line" in the dining room to call headquarters. He informed them that he had four dead bodies within 112 Ocean Avenue. The kitchen nook in the DeFeo house. It was here that Father James McNamara, the DeFeo's parish priest tried to console Butch DeFeo. It was also in this spot that Butch informed Amityville P.D. Officer Kenneth Greguski that he had two sisters who also resided in the house. This prompted Greguski, and Amityville PD Officer Ed Tyndall, who was just arriving to go upstairs and investigate further. Overhearing this, Butch DeFeo, amid his grief, managed to interrupt Greguski. Now having the cop’s attention, Butch informed him that he also had two sisters who lived within the house. Greguski told the dispatcher to hold or informed them that he would call back, briefing dispatch on this latest development, and saying that he would investigate further. As Greguski made his way toward the front foyer and staircase, Amityville officer Ed Tyndall likely met him at this point. Tyndall had come to assist Greguski, even though, like Greguski, he wasn't fully aware of what was transpiring at the DeFeo residence. Briefing him quickly, the two officers made their way upstairs. This time, the first door on the eastern side of the stairwell was opened. With the flick of the light switch, the horror contained herein revealed itself to the cops. What was already a horrific scene was becoming worse with every minute. Standing at the threshold between the second floor hallway and Allison DeFeo's bedroom, this is precisely what Officers Greguski and Tyndall discovered. Thirteen-year-old Allison DeFeo was clearly beyond help. The blood from her massive head wound had run down the mattress and boxsprings to the carpeting below. This was the bedroom of Allison DeFeo, 13. Allison, brunette, small and petite was laying face down in her bed. Like her mother, she had been tucked neatly into the bed and the covers masked her wounds. Regardless, it was evident that she was dead. What the soft pink blanket covering her did not hide was a river of blood that had run down her mattress and box springs to the carpet below. The carpet had absorbed a massive amount of blood. At cursory glance, it would appear, based on the higher placement of blood that she had been the recipient of a head wound. However, neither officer disturbed the scene and it was becoming evident to both that this case was going to be out of the hands of the village Police Department. All felonies, such as murder----a mass murder in this case----fell under the auspices of the Suffolk County Police. Originally assuming that the staircase a few feet from the doors of the boys and Allison's room led to an empty attic, the cops now ascended the nine steps to the third floor landing. Rounding the landing, and up the three steps to the hallway floor, Tyndall and Greguski first stopped at the door on the right. 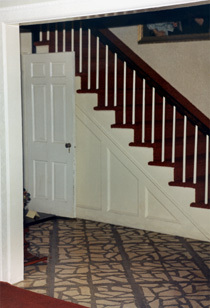 Right, the stairs leading to the third floor attic bedrooms of the DeFeo house. 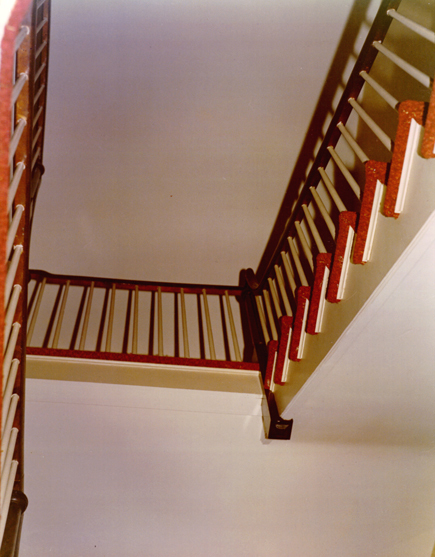 Initially, Greguski and others believed that these stairs led to an unoccupied attic. However, as they ascended the stairs, the smell of death became overwhelming. Above, the 3rd floor bathroom. The 3rd floor hallway. Directly to the right of the chair was the bathroom door. To the left would be the doorway to Dawn DeFeo's bedroom. 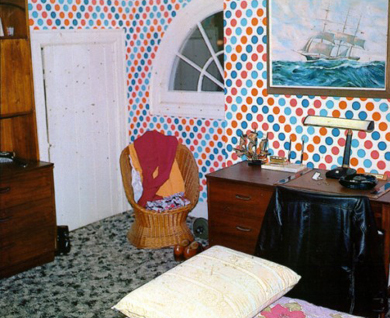 The room proved, thankfully, empty, and as they would later learn, this rather obnoxious polka-dot-wallpapered room with it's eye-like quarter moons that looked out to Ocean Avenue, was that of Butch DeFeo. So far, this had been the only bedroom in the house not marred by the horrors of murder and bloodshed. Quickly "clearing" the room, the officers turned to their left and crossed the hallway rounding the banister of the third floor steps. In front of them, another doorway. To their right, a small bathroom, tidy and clean. The body of Dawn Theresa DeFeo, 18. Entering the third floor bedroom and turning on the light, the first thing to hit Tyndall and Greguski was the unmistakable stench of death. The smell was stronger at the threshold of this third floor bedroom than anywhere else. The room was loud with a gold-metallic wallpaper covered in a colorful floral print; the light reflected brightly from the wallpaper. At the far end of the room, a giant window looked out on the DeFeo's boathouse and swimming pool in the backyard. In the center of the room was a bed. 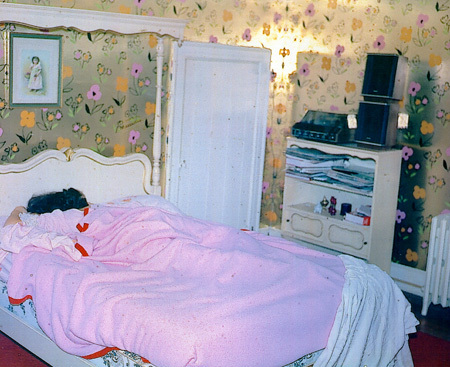 In that bed lied a figure, obviously that of a female based on the tuft of matted brunette hair and pink nightgown that stuck out from the top of the pink blanket. Again, at first glance, she appeared to be sleeping. However, by now, it must have been assumed on the parts of both officers that, even without further examination, this girl, likely in her teens, was dead. Moving closer, what appeared to be brain matter and blood covered the pillow with traces of such splattered across the white sheets that donned a colorful butterfly print pattern. The officers were looking at the body of the DeFeo's eldest daughter, Dawn, 18. Even without disturbing the scene, it was apparent that she too had suffered a massive head wound. 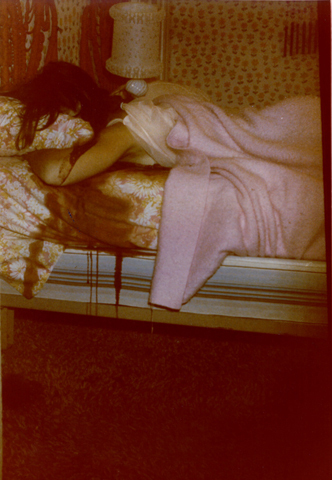 Yet, strangely enough, she was tucked perfectly into bed as if sleeping, just as her mother and younger sister were. Even more interesting, the white headboard of her bed was squeaky clean when, clearly, if she had been shot in the bed, it should have been doused with brain matter and blood. Either she had not been shot here, or the headboard had been cleaned up. Tyndall and Greguski returned downstairs, and likely a bit more frantic, Greguski called dispatch and advised them that he had six confirmed dead at 112 Ocean Avenue. Not only would more village cops be enroute, it was evident that the Suffolk Police Homicide Squad would be needed as well as the Suffolk Medical Examiner. The discovery of the DeFeo bodies was a night that would alter history for this small south shore village and put it on the map of American pop-culture forever with the stories of demonic possession and evil forces that would prevail in the years following. Ronald "Butch" DeFeo, 23, was taken out of the house shortly thereafter, even as the DeFeo's parish priest, Father James McNamara tried to console the grieving DeFeo. Initially, DeFeo was moved to the Ireland's residence next door to get him out of the house in an effort to lock down and secure the crime scene. The Ireland's house was used as a sort of "command post" off the DeFeo premises. Suffolk County Detective George Harrison, who had been on the force for several years, was working the 5 p.m. to 1 a.m. tour at SCPD Homicide. The case was ultimately assigned to Harrison and his partner, Det. Gerard Gozaloff, though they were not the first SCPD Homicide Detectives to arrive at the scene. After Harrison arrived, during the 8 o'clock hour, Gozaloff arrived shortly thereafter. While Harrison would remain at the scene throughout much of the night, it was his partner Gozaloff that would be assigned to DeFeo. Gozaloff would accompany DeFeo to the First Precinct where questioning would begin later that night. Initially, because the entire DeFeo family was dead and there was no apparent motive, the Suffolk Police sought to "safeguard" DeFeo. However, by the next morning, November 14, 1974, a grim picture of what had really happened in the DeFeo home was beginning to emerge. Ultimately, DeFeo admitted to SCPD detectives that he had killed his family with a high powered Marlin .35 rifle. The police recovered the rifle in a the canal blocks from the DeFeo house thanks to the diagrams that he drew for them showing where he disposed of it. He stated that once he had started, the commission of the crime went very fast and he was unable to stop. By the evening of November 14, DeFeo was booked. The following morning he was arraigned for the mass murder of his family. By the morning of the 15th, the local newspapers had the story, and to say it was shocking to the residents of the sleepy village of Amityville would be an understatement. The New York Daily News, on that day, proclaimed "Son Charged In Slaying Of 6," while other area headlines screamed similar headlines. In the case of The People of the State of New York versus Ronald J. DeFeo Jr., the prosecution team, headed by Suffolk County ADA Gerard Sullivan made a succinct, efficient case against DeFeo. They alleged greed on the part of the 23 year old, stating that he wished to get his hands on an early inheritance, which, in addition the to assets of the DeFeo state also amounted to more than $250,000 in life insurance policies. DeFeo was ultimately found guilty and sentenced to six consecutive life sentences for his crime. Today, at nearly 59 years old, DeFeo remains incarcerated in upstate New York for the crime, which he perpetuated alone. Is it possible that there was more than one gun used in the commission of the crime? Were all of the victims killed in bed? Why, and how, were six individuals on two different levels of a Dutch Colonial home killed and yet no one got out of bed? 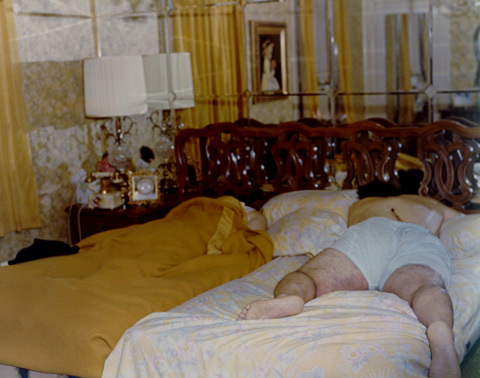 Was it possible that Ronald DeFeo Sr., weighing 270 pounds was shot elsewhere and placed back into his bed? And, if this has merit, does it not suggest that more than one person was present in aiding the 165-pound Butch DeFeo in returning his father to the bed? Why did the prosecutor, at trial, in his opening arguments assert to the Jury that Butch placed his father back into bed? Yet, later, during the trial, this was never explained? What about the private investigator retained by the defense and his testimony to the Court in a pretrial hearing? The retired NYPD homicide investigator stated that he had every belief, based on his independent investigation, that there were other perpetrators than Butch DeFeo? Did the cops beat a confession out of DeFeo? Was Butch DeFeo's eldest sister one of the perpetrators?